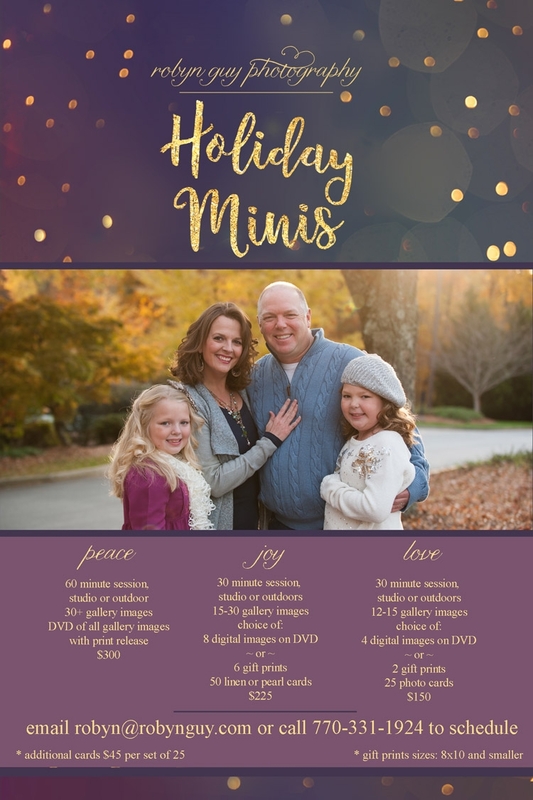 robyn guy photography is happy to announce 2018 holiday specials! This fall, sessions are available outdoors. Sessions include photography time, an online gallery, either prints or digital images, and design for your holiday cards. Additional prints are available for purchase at a discounted price. Outdoor sessions are available both weekend and weekday times. Payment of session retainer reserves your time. Please let me know if you need a special time or if you have a special location in mind and we can discuss availability. Card designs are complimentary and include up to three design revisions. Photo cards may be upgraded to linen or pearl for $10 per set of 25. Additional sets of linen and pearl cards are $45 per set of 25. Packages $300 and up also include a discount of 50% on all a la carte print purchases.